My Grandma always had the simplest recipes. She was also infamous for never measuring anything, but it always turned out!!! 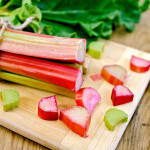 This is an awesome recipe for rhubarb in-season. Cream the 1/2 cup butter with 1 cup brown sugar and 1 egg. Add to this the vanilla, sour milk, baking soda, salt, flour and diced rhubarb. Put it all in a lightly greased 9"x13" pan. Top this with a mixture of 1/2 cup brown sugar, 1 tsp cinnamon, cut in 1 tbsp. butter, and add 3/4c. coconut. Bake in 350 degree oven for 35-40 minutes.